Sandni, a village in Rajasthan's Chittorgarh district, has been waging a decade-old battle with the forest department to resolve a peculiar question: is bamboo a grass or a tree? The answer is crucial for the 400 residents because it means the difference between becoming rich and staying poor. The villagers protect the nearby forest under the Joint Forest Management (JFM) programme. The forest, because of their labour, has a rich cover of bamboo but JFM gives them full legal rights to collect only grass. Botanists classify bamboo as a grass species, but the Forest Conservation Act, 1980 does not. So the villagers are prohibited from harvesting any bamboo, which could be a renewable source of livelihood for the villagers and fetch about Rs 80,000 a year to the village, every year. Bamboo could be a crucial employer. It has exceptional versatility -- as many as 1,500 uses, including as building material, and for making agricultural appliances, handicrafts and paper. It is also a renewable resource and farmers currently get up to 7.5 tonnes per ha (dried wood) on a three-year rotation, which following the South Asian experience, can be increased to 20-30 tonnes dried bamboo harvested on a sustainable basis. The data collected by the Centre for Science and Environment's Green Rating Project shows that pulp industry -- which incidentally pays the lowest rate for wood -- pays Rs 3,400 per tonne for dry bamboo and if productivity increases, the annual income to the farmer can go up to Rs 34,000 per ha. And if farmers were to sell the high value bamboo products they would make even bigger profits. The Indian government, too, plans to go in for fresh bamboo plantation over six million ha during the next ten years under its National Mission on Bamboo Technology and Trade Development (NMBTTD). It also agrees that this could be a money and job spinner. According to Planning Commission estimates, altogether, 8.6 million jobs would be generated, that is, 1.4 million jobs per million ha of plantation in the next 10 years. But why all this glib talk about bamboo's potential? Does the government have any clue about how it will grow the bamboo? No. The fact is that farmers cannot sell bamboo, other than in the Northeast of India, because of forest laws. The forest department, which has the land to grow the bamboo plantations, cannot protect the saplings from the grazing animals. The people, who can protect the saplings, like the residents of Sandni, are not given the option to earn from their labour. The Supreme Court (SC) had banned felling in forest areas in December 1996. The forest departments used the order as an excuse to enforce a ban on bamboo felling. In 2001 MP, AP and Rajasthan forest departments did seek clarifications from the apex court whether bamboo generated under JFM could be extracted. But the Union ministry of environment and forest (MoEF) refused permission citing that without a working plan the permission was not possible due to a court order. Then in February 2002 the SC clarified that its 1996 order prohibiting cutting of trees (except in national parks and sanctuaries) did not apply to bamboo and cane as it was a grass. After this clarification, the state has been trying its utmost to get it revalidated. The question also is if bamboo is a minor forest product, (MFP) which would allow states to distribute it free of cost or at nominal charges to people. Only AP, MP and Rajasthan include it in the MFP list, with MP giving 100 per cent of the bamboo revenue to its JFM committees and AP 50 per cent. 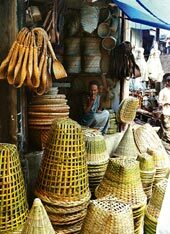 Orissa, on the other hand gave the state forest development corporation the sole right to market bamboo. The state governments under various laws have monopolised bamboo and offer only limited share of the revenue to people under JFM. It's all about money. The forest departments lack revenue sources, particularly after the SC's ban on tree felling without a clear management plan. Bamboo being outside the ambit of the order provides the department with its necessary finances. Why would it want to share the booty with the people? In contrast, China had decentralised the bamboo trade after the 1979 land reforms. Villages were allowed to grow and harvest the 'grass-tree'. As a result China now exports bamboo and its trade in fresh shoots has proved to be more profitable than tea, silk or even rice. But will India's forest bureacracy learn some lessons from our neighbours?